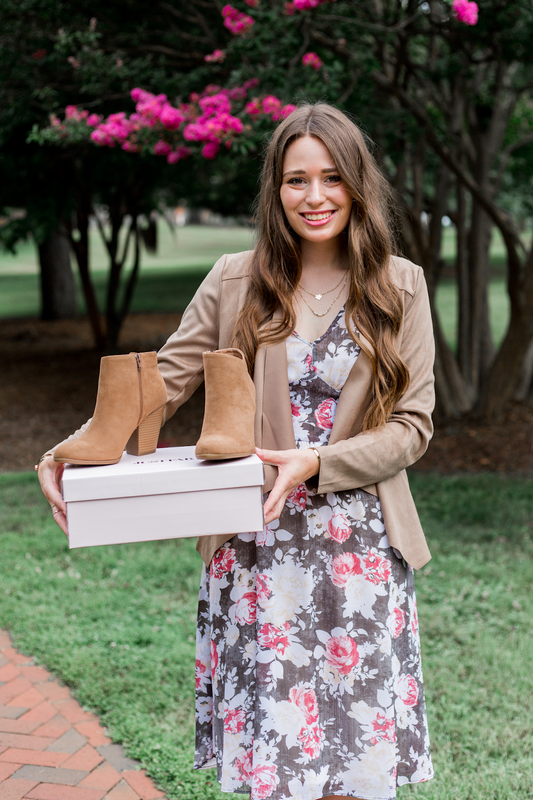 Summer to Fall Business Casual Look + INSTAGRAM Feed Talk! Happy Monday- lots to chat about today! I recently styled this outfit from JustFab for an Instagram collaboration, but I loved the photos and outfit so much that I wanted to share here on my blog as well. 😊Further down in this blog post, I'm also sharing some thoughts about the direction I want my Instagram content to go in, and I'd love your feedback! Styling this outfit for an Instagram collaboration was actually my first time trying things from JustFab- but I can definitely say I'm a fan!! I was curious how this dress would actually look on me after seeing it online, but I love it. 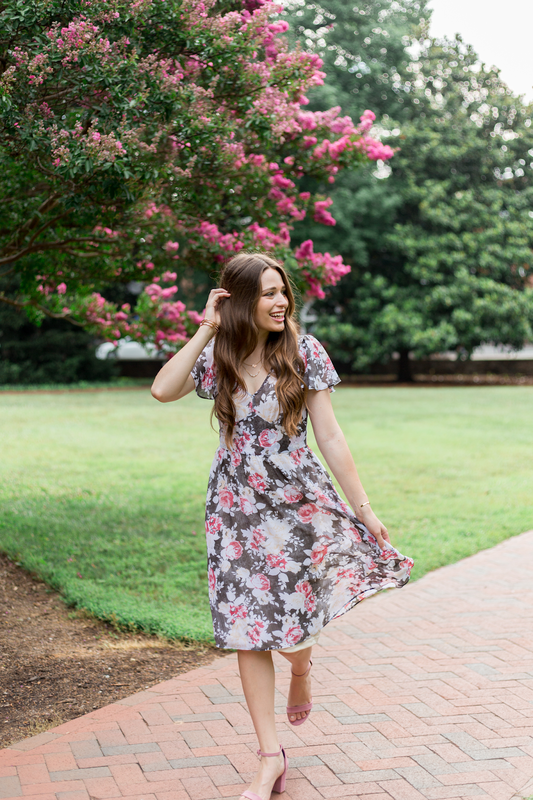 It's such a flattering style, and the grey floral print would be so easy to transition from summer to fall. Pair this dress with these pink suede block heels and suede jacket makes the ideal business casual look for this time of year. It's a bit too dressy for me to wear this outfit to my job (Although who are we kidding- I've worn stuff fancier than this to work! ), but this is also an ideal church outfit in my opinion! I've always been #TeamDressUpForChurch- so you can bet I'll be wearing this outfit to a Sunday service this month or next. Changing gears for a second to talk about something that normally try not to talk too heavily about on my blog: the I-word. Instagram!!! It seems like every time that a blogger says anything about Instagram online, it immediately becomes a long rant about how the algorithms are making their lives miserable, and it's all Instagram's fault if they aren't getting a lot of likes, engagement, or collaboration opportunities. While I do often *internally complain* to myself about how frustrating using Instagram as a blogger can be, I don't feel there's much of a purpose in sharing those rants here on my blog. It's all been said many times before by too many bloggers to count! What I would like to talk about today instead related to Instagram is my thoughts about the type of feed that I want to curate here on out. There were lots of fashion influencers already on Instagram way back in 2012 when I made my account. (My @miss_alk account was created a few months before I started this blog, and I used it for a long time as personal feed!) There were tons of fashion influencers on Instagram in 2015, when I made a separate personal account and started using @miss_alk really just for fashion and blog content. And today in 2018? TOO MANY fashion bloggers and influencers on Instagram to count!! Something that I've started to notice about a lot of the newer fashion blogger feeds that are popping up is that they all look exactly the same. And no- I'm not talking about how the photos are edited or the weird orange preset trend that's going around (that's a discussion for another day). I mean the types of poses girls are doing, the standard Instagram "props" that everyone has in their photos (Starbucks cup, flowers in purse, etc etc), the clothing itself... it's a rare day on Instagram now when I don't see several girls all wearing the same top or dress from Nordstrom. And captions! Oh my goodness, everyone's captions sound exactly the same. This might be what's been bothering me the most! You'll see a couple superficial lines about "OMG it's finally Fri-Yay! Who else is #WeekendReady?" or "I am so obsessed with this top! My favorite top ever! I bought it in all 6 colors omg omg omg!" And you know what I have to say about all of these repeat Instagram behaviors? After blogging and being apart of this world for almost six years... I'm sick of all of this! I have nothing against putting time into creating visual content, whether for your blog itself or Instagram. I really do love and truly appreciate good photography- it's why I've been working with photographers for the majority of my own content for 2+ years now. The issue that I've been having lately with following fashion bloggers is that there seems to be no more creativity. Everyone is copying everyone else, and worse then that- everyone is trying to shove sales down my throat. I don't think there's anything wrong with using Liketoknow.it on Instagram (I obviously use it myself). It can be a useful tool to find out where items are from, and I have the app on my phone to use for shopping other blogger's photos sometimes. My issue is that for so many fashion bloggers right now, it seems like they only use Instagram because of Liketoknow.it. They're solely existing and operating their brands with the desire to sell me things, not to inspire me. I started this blog during my freshman year of college as a way that I could share the fun and creative outfits that I'd wear to class and school activities on weekdays. I didn't have a huge budget to spend on clothing or accessories, and I wanted to blog to hopefully inspire girls who shared my love of fashion and also shared my limited budget. 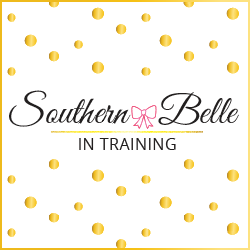 While my blog has changed a lot over the years, and now of course I do use affiliate marketing and create sponsored content for brands, my goal has remained that I want to inspire people. I want girls (and some guys?) who read this blog to feel like we are virtual friends, and that if I'm wearing something or recommending something, it's like friend-to-friend conversations where I share things that I love. When I see fashion blogger after fashion blogger who only wants to sell me the latest thing that they're wearing on their Instagram, it feels less like a friend relationship and more like they're those annoying kiosk salespeople in the mall chasing me down. Anyone else feel that? So why am I bringing this up today? I want to start making some gradual changes to my Instagram feed. I'm still going to use Liketoknow.it, because like I said above I do think it's a useful tool. However- I don't want this to be the focus on ANY of my posts (okay unless maybe it's a Lilly Pulitzer sale week- #honesty). I want my not only my photography on the 'Gram to be creative and detailed, but also my captions to be on the same level of thought. I want to STOP taking the easy way out and captioning a really beautiful photo something like "OMG love this blue dress!! Download the LiketoKnow.it app to shop it now" to funny captions, to have personal captions, to have a caption that makes you smile and chuckle, and also some captions that make you stop and think. I will still be posting outfit photos- because styling looks and shooting them is something that I enjoy (all in hopes to inspire someone else). But with that said, going forward with my Instagram I also want to include more of my own photography. I actually love taking my own photos when I'm traveling, or even locally sometimes!! Being behind the camera and not just in front of it is something that I want to continue to do. I want to share with y'all way more of my pictures of landscapes and flowers and city skylines and just anything that piques my eye to take a picture!! More uniqueness and true inspiration in my feed, less doing what everyone else is doing. I'm not saying that I'll never post a selfie or picture of me doing a typical blogger pose while holding a coffee cup ever again- but if I do post a photo of one of those things in the future, there will be a purpose for sharing that image on Instagram, and the purpose won't solely be trying to sell you something on Liketoknow.it, or having to post just for the sake of posting. Hey boo - you look BEAUTFUL!!! 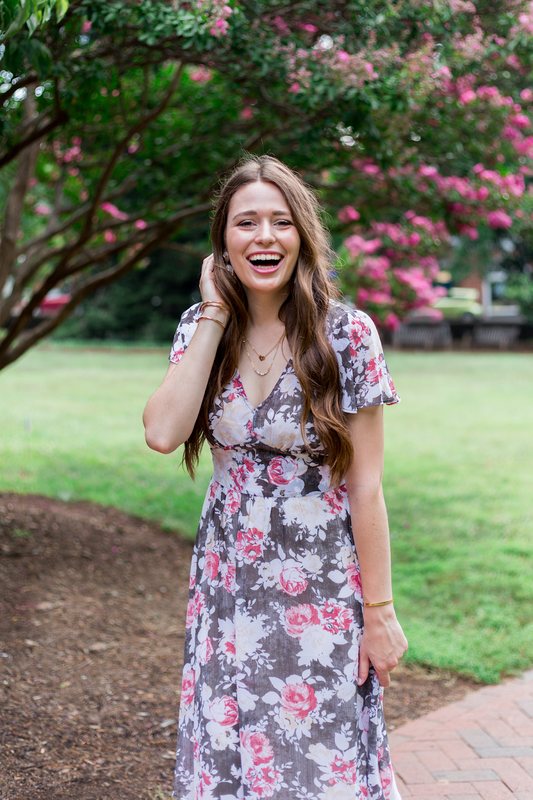 I LOVE the way you styled this gorgeous dress! Also, you touched on such a big topic lately that's booming...EVERYWHERE on twitter, blogs, ect. I love that you want to take out the mundane "I like this blue dress follow me on liketoknow" I TOTALLY AGREE WITH THIS. I am so much more of a lover of a genuine caption, you know?! You're so smart! This was a great post to read early in the morning! First of all, this dress is so gorgeous!!! 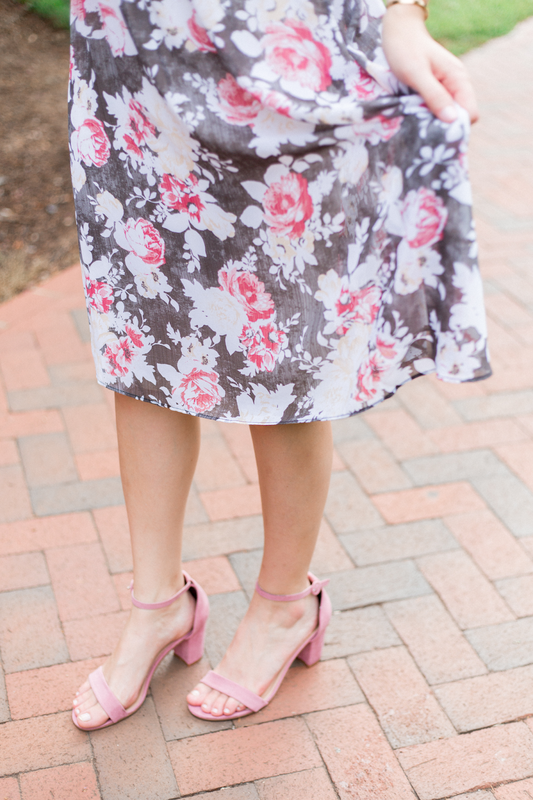 I love the heels you styled it with. And I completely agree with you about the captions and similar content. If you're not looking at a username, it could be all the same person! I love following people who wear and do what they want -- not because it's trendy. Looking forward to seeing your changes in the coming months! Whenever I read your blog, I always feel like I'm talking to a friend. This post was no exception. I love how real and honest you are. I totally get your whole IG rant lol those same exact thoughts go through my head. This dress with the jacket is perfect for a transition outfit! girl - i swear we are two peas in a pod. wish you lived closer! This dress is gorgeous, girl and I love both shoe options. Now -- I'm TOTALLY with you on IG. I hop on for a second and the first 3 pictures are of fashion girls wearing the same top or shoes and trying so hard to sell them. I am so bummed about my slow growth and the "fake-ness!" What a gorgeous dress! The IG struggle is so real but I have found that it's not worth it to complain about anymore. Love that dress. It's such a pretty one, the silhouette is such a flattering one. I need to get more in front of the camera, I've felt so self-conscious about myself lately. loveeee your ramble! this was a big reason why i unfollowed so many accounts earlier this year! I couldn't tell them a part and I hate being sold something nonstop! I think everything should be posted with a purpose, it makes it more fun! I love the booties, they're so cute! I'm definitely in need of a pair for the upcoming fall! Couldn't agree more girl! I have tried so hard to just do what i want with my account! It's so hard to not compare yourself and get stuck in the rage to need to be above and beyond... but staying in my own lane has helped so much! I really love your new thoughtful take on Instagram. I've been trying new things with my editing but like you said, I should start thinking more about how I caption the photos too! That dress is so pretty! And I think changing up your account a bit is a great idea and a great change that'll help you want to be engaging more too! I've noticed the same with mine! First of all, you've long been one of my favorites to follow on the 'gram because you keep it SO real! Your captions are always conversational-not just advertising, that's one thing that keeps me following you :) I've honestly let Insta go to the back burner lately because I've become bored with it. I don't always post the most polished photos, because I enjoy sharing well...what I enjoy! But this post made me feel like I need to get back to doing what I like, not what I think 1.5 million people using the app will like! I meant to comment on this sooner but I am THE worst about reading something via Instagram story and then not commenting haha. This business casual look is super hot. I am planning to gift that heels to my sister on her birthday and for that I will Pawn a watch to the pawnshops. I really got an idea of gift. Thanks!